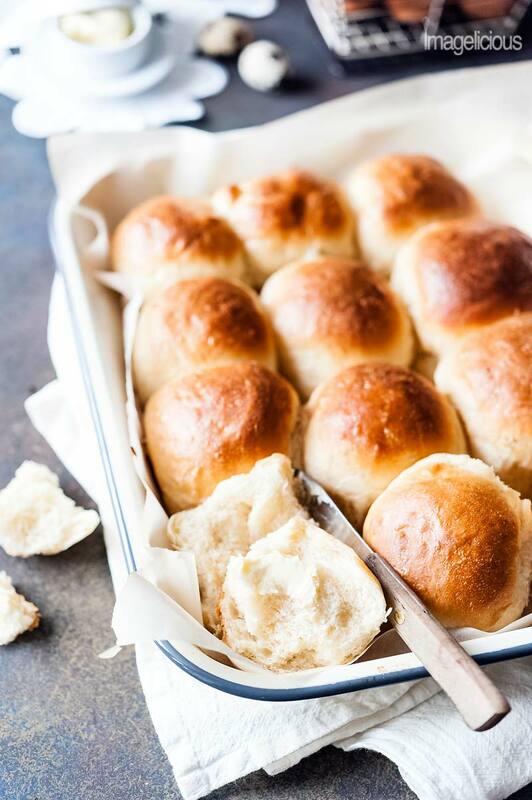 Instant Pot No Knead Dinner Rolls will be the star of any meal. They are feathery light, buttery, and soft. These bread rolls are perfect for sandwiches or an accompaniment to a roast. Easy to make without a mixer. They require no kneading and rise in your electric pressure cooker. This post contains Amazon affiliate links which means that if you purchase an item after following one of those links I will receive a small commission. 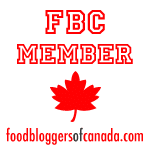 I was going to wax poetic about food and nostalgic memories that are often invoked by it. About returning to my childhood, to the time of innocence when every taste, every flavour is so much more intense and bright. I was going to talk about dinners at the cottage with my grandparents, leisurely weekend breakfasts with my mom, the excitement of waiting for my favourite cake to be cut on my birthday. I was going to talk about the smells and the time machine that they are. The smell of a pie baking in the oven transporting me momentarily to the long-forgetten time three decades ago. Or the sizzle of the onion hitting the foaming butter and reminding me of my wedding day. Or that intoxicating yeasty aroma of the most beautiful and soft bread that just came out of the oven and reminded me of all those failed attempts to make bread in my 20s. I was going to write so much but then I realized that no matter how much I wanted to make this post into a story, there really was no story. Sometimes you just have to let the food speak for itself, take the centre stage, and let it shine. There will be plenty of stories, plenty more memories that I will eventually share. But today, the story is simple. 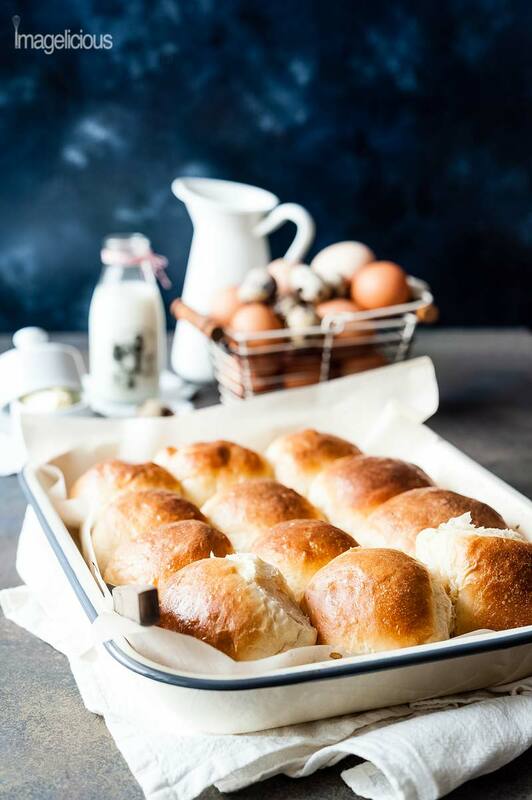 It’s the story of delicious, amazing, and a little bit magical Instant Pot No Knead Dinner Rolls. I’ve been using my Instant Pot for the past four months and although I liked it a lot, I was not in love with this appliance. Until I made these Instant Pot No Knead Dinner Rolls (three times many times now) that is. Making dough is not this nifty electric pressure cooker’s main (or even secondary or tertiary) function, yet Instant Pot Bread is exactly what made me a true convert and a true lover of this appliance. If you are still on the fence about buying your Instant Pot, then read my article about 7 Things You Need To Know About Instant Pot and why you might not even want to buy it!!! Now, I am absolutely in love with Instant Pot. I use it 3-4 times a week on average, often more, often multiple times a day. Don’t forget to check many more of my Instant Pot Recipes. Instant Pot Bread is a true one-pot recipe. Meaning that I don’t have to use a separate pot to melt butter or a small bowl to microwave milk. Everything is done in one pot – Instant Pot. I don’t ever knead bread by hand. I know lots of people swear that it’s therapeutical but I don’t have the patience for it. I usually let my KitchenAid mixer do all the work. It’s not difficult at all but it requires time as the flour is usually added a little bit at a time and then the kneading takes another 10 or so minutes, thus making the whole process at least a quarter of an hour.With my method, everything is mixed together in the Instant Pot (or another Electric Pressure Cooker that has a yogurt function) with a spoon with no kneading and left alone. 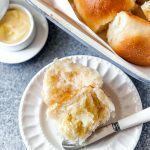 You can most likely still use the recipe for these Instant Pot No Knead Dinner Rolls even if you don’t have an Instant Pot or another electric pressure cooker. Just mix the bread dough with a spoon following the instructions, cover the bowl with plastic wrap and let it rise. It most likely will need more than one hour to rise, I would suggest leaving it be for at least a couple of hours. Then follow the rest of the instructions in the recipe to bake these delicious Dinner Rolls. My favourite way to let the dough rise is to put the stopper into the sink drain and fill the sink with really hot water. Then put the plastic covered bowl with the dough into the sink. Make sure that water is at the level of the dough in the bowl. I usually refill the sink with hot water once or twice during the rising process. NOTE: You can use this method if your Instant Pot does not have a Yogurt button. If you’d like to get one, this is the exact model that I have. How much flour to use? 2+3/4 cups all-purpose flour will make perfect, soft, and delicious rolls. You can see the fluffy texture in the video. The rolls will also be easy to form. 2+1/2 cups all-purpose flour will result in airy and feathery dinner rolls. They will be extremely light and delicious. The dough, however, will be very sticky, so forming the rolls will be a bit messy. 3 cups all purpose flour is what I use in the summer when it’s humid. Try different versions and decide which one you like best. I prefer 2+3/4 cups of flour since the dough is a bit sturdier and the dinner rolls are easier to form. IMPORTANT NOTE ABOUT THE FLOUR WEIGHT: I have done a weight test on my flour and 2+3/4 cup of flour consistently weigh 440g when I measure it. In ALL my tests over the past many months, 1 cup flour = 150-160g. If you bake a lot, you’ll notice that it’s considerably more than what all the google research will tell you. I do not really know why that happens but I tried weighing the flour on different days and scooping it out with different measuring cups and the weight is consistent. Now imagine that you are trying to wrap something in it, so gather all the edges around that “imaginary filling”. It’ll also look like it’s a ballon with just edges together. TIP: Coating hands with vegetable oil means that the dough will not stick to your hands. Alternatively, you could use more flour to make the dough less sticky but it’ll be a bit messier and the more flour you add the less fluffy the rolls will get. 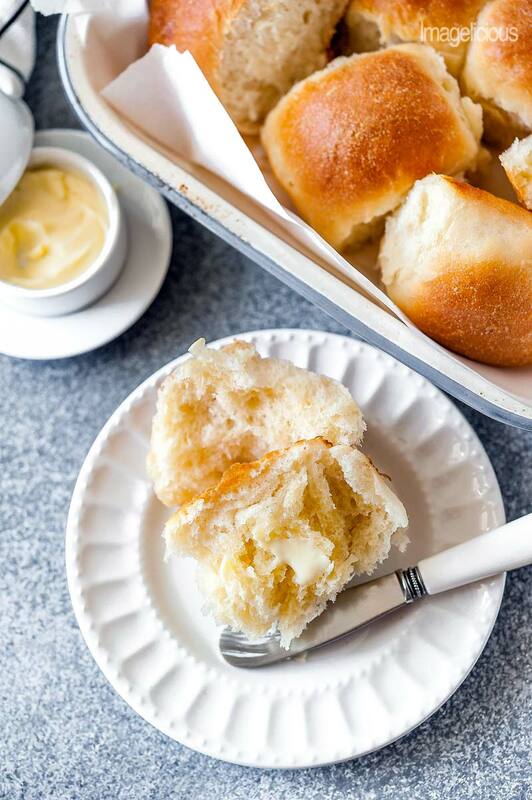 Watch the VIDEO to see how easy these Instant Pot No Knead Dinner Rolls are to make. Watch until the end to see how perfect and feather light they are!!! 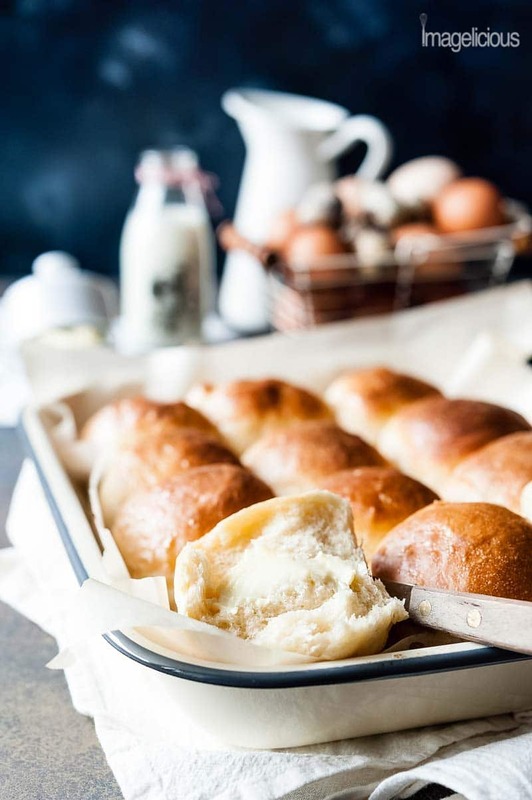 What kind of substitutions can you make when baking these Instant Pot No Knead Dinner Rolls? Remember, all these substitutions will change the recipe so the taste will be different from my original Instant Pot bread recipe. You can use white or brown sugar instead of maple syrup. Can you omit any sweetener altogether? Yes and no. I would suggest adding at least half a teaspoon of sugar to the butter/milk mixture. Sugar helps the yeast develop and start working. You can use 1 or 2 egg yolks instead of a whole egg. It’ll make the rolls taste a bit richer and more like brioche. You can omit the egg altogether. It’ll affect the taste a little bit but not much. No need to add any egg replacement or substitutions if you can’t have eggs. You can use 5% cream, 18% cream, or even 35% cream instead. If you don’t have any cream, you can use milk, however, cream not only adds flavour, it also has fat which affects the texture. So, using milk only will affect the texture of the rolls a little bit. 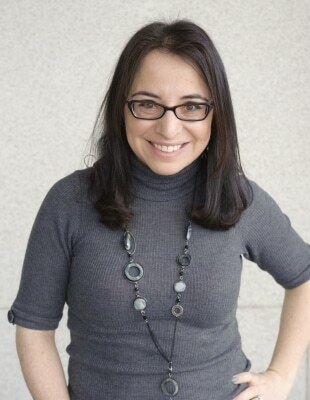 Can you use plant-based milk? I don’t know. I have never tried myself. I am going to guess that yes, but as I haven’t tried baking with any plant-based milks before I can’t promise results. You can use water instead of the milk (and cream). This will definitely affect the flavour and the texture of the Instant Pot No Knead Dinner Rolls but it’ll still work. Most likely you could use margarine or other non-dairy butter if you are trying to make these rolls vegan but I personally haven’t tried. The flavour may change though. Some readers reported that the flavour of these rolls is very yeasty. I don’t find it too yeasty at all. I have also served these to many different people who also claimed that these Instant Pot No Knead Dinner Rolls tasted delicious. However, I have tried this recipe with just 2+3/4 teaspoons of yeast (that’s one envelope) and it turned out fine. It had less yeasty flavour but I actually prefer them with 1.5 tablespoons as described in the recipe. So, just to recap, you can use just 2+3/4 teaspoons of yeast if you desire. Cream as described in the recipe. It adds a nice milky flavour and makes the tops golden. Egg wash. Mix one egg very well with one tablespoon of water. It’s the most traditional way of brushing rolls. It makes a really beautiful and golden crust. I personally rarely use this option because I find it a bit wasteful. In most cases there’s a lot of egg wash leftover and I hate throwing it away. Sometimes, I actually save the egg and water mixture and make myself a small omelet. NOTE: A culinary student commented on this recently and apparently egg wash can keep in the fridge for up to one week, so if you bake bread more than once a week then this might be a good option for you. Vegetable oil. You already have your hands covered in vegetable oil when forming the dinner rolls so just brush a bit extra on top. Melted butter. It will add an extra buttery flavour and a beautiful golden colour. I don’t have a microwave so melting one tablespoon of butter requires too much effort. Otherwise, I’d be all over this method! A few readers said that the Instant Pot No Knead Dinner Rolls were dense. They will not be dense if the yeast worked properly and the dough rose. You MUST make sure that when you add the yeast to the butter and milk mixture, it is NOT hot. If the mixture is too hot then it will kill the yeast, so it won’t work and all you end up with would be just liquid and flour, which would make for really dense rolls. You MUST wait for the yeast to foam, it will take about 5 minutes. You can see how it looks in the video. If the yeast does not foam, then the rolls will not work. This is NOT a recipe for beginner bakers. You need to know how to make bread and understand the science behind the ingredients. Depending on your location and the weather (altitude and humidity), you might even need to add more flour or less flour. I will be happy to troubleshoot the recipe with you if you contact me. On a personal note, I know this recipe WORKS. As I tested it extensively. I’ve made it with regular KitchenAid mixer and kneading many times. And I made it in my Instant Pot without kneading a couple of dozens times. IT WORKS! It’s supposed to be sticky! It’s supposed to be messy! The texture is NOT the dough that you get from a can. The only time it did not work was when I killed the yeast by adding it into the milk/butter mixture which was too hot. I knew it wouldn’t work when the yeast did not foam. IF IT’S HUMID AND SUMMER: It’s summer and very hot where I am right now and humid. So, I use 3 cups of flour and I bake these rolls for 20-25 minutes. I will revert back to using 2+3/4 cups of flour and baking for 15-20 minutes once the temperature cools and the humidity drops. Throw the mixture out and try again. NEW: If the yeast didn’t foam because the liquid was too hot, add more yeast and let it foam again. I personally tried this option once recently and it worked perfectly. I didn’t have to throw out butter/milk mixture. One time when the yeast didn’t foam, I still tried making the dough in hopes that it would miraculously rise. After one hour on a yogurt function it, obviously, did not rise but that one hour resting time made the resulting dough very pliable. I separated the dough into four parts and rolled each piece of dough to about 1/4-1/3 inch thickness. I then brushed the pieces of dough with a bit of oil, added various toppings and baked at F425 for about 15-20 minutes. The resulting flatbreads were delicious! NOTES ABOUT YEAST: This particular recipe uses a lot of yeast, 1.5 tablespoons (4.5 teaspoons) to be exact. This is a personal preference. I love the smell and taste of yeast in bread. You CAN use 2+3/4 teaspoons of yeast. I do NOT find that the flavour is unpleasant. None of my friends or family think so either and they request these dinner rolls often. However, it is a personal preference! You may not like this amount of yeast. I love this method of making No Knead Dough in my Instant Pot and letting it rise on the Yogurt function so much that I created two more recipes! 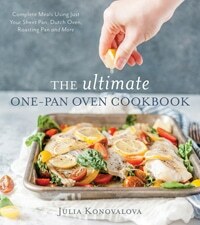 And on a totally different note, don’t forget to order my new cookbook, The Ultimate One-Pan Oven Cookbook, it just came out on August 28, 2018!!! 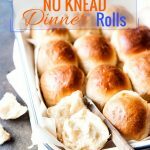 Instant Pot No Knead Dinner Rolls will be the star of any meal. They are feathery light, buttery, and soft. Perfect for sandwiches or an accompaniment to a roast. Easy to make without a mixer. They require no kneading and rise in your electric pressure cooker. Turn your Instant Pot on and press sauté button. Add the butter and 1/4 cup milk to the pot and wait for the butter to melt. Turn the Instant Pot sauté function off once the butter starts to melt. The pot will still be hot so everything will melt and heat up nicely. Add the remaining 1/2 cup milk and 1/2 half and half cream to the pot and mix. IMPORTANT: At this point you might need to wait 2-3 minutes to cool the mixture if the pot got too hot. The butter and milk mixture needs to be warm but not hot, so test it with your finger. If it's too hot then the yeast won't work. Add the maple syrup, yeast and mix. Wait for about 5 minutes to make sure that the yeast foams. Add the egg and mix it in with a spoon or a spatula. Add the flour and salt and mix everything together just until flour disappears. Close the lid of your Instant Pot. Turn the valve to a sealing position. Press the Yogurt button and choose time of 1 hour. You need a model of Instant Pot that has this button. This is the one I use. After one hour take the Instant Pot lid off. The dough should have at least doubled in size. It will be light and spongy. Mix it with a dough scraper or your hands. While the oven is preheating, form the rolls. Line a 13x9" pan with parchment paper for easy cleanup. Lightly coat your hands in vegetable oil, it will help with the dough not sticking to your hands. Take a little bit of dough and flatten it slightly, now imagine you are wrapping something inside that dough by stretching all the edges around it like a balloon. This will form a nice ball with a "seam" at the bottom. Place the ball seam side down onto the prepared pan. Repeat with the rest of the dough making 12 Dinner Rolls. Alternatively, you could make 16 smaller Dinner Rolls. Cover the pan with a clean kitchen towel and leave for 30 minutes for the rolls to rise. After 30 minutes, brush the rolls with a little bit of half and half cream. Bake in the fully preheated oven for 15-20 minutes until the rolls get golden brown. NOTE: if it's humid where you are, you might need to bake for 20-25 minutes. Some readers reported that these rolls taste too yeasty. I love the flavour of yeast in my baked goods so I find that they taste just absolutely delicious and perfect. However, if you prefer, you can use just 2+3/4 teaspoons (1 envelope) of yeast instead of 1.5 tablespoons. I tried them with just 1 tablespoon and the dough worked just fine. You could use either 2+3/4 cups of flour OR 2+1/2 cup flour. If you are using less flour, the dinner rolls will be lighter and airier, but the dough will be much stickier, so it'll be more difficult to form the rolls. NOTE ABOUT HUMIDITY: Now that it's summer and humid where I am I use 3 cups of flour! and I bake the rolls for 20-25 minutes. When it'll be cooler and dryer in a few months, I will revert back to using just 2+3/4 cups of flour and baking for 15-20 minutes. IMPORTANT: Please read notes above the recipe to make sure you know how to get the yeast to work. It is NOT a recipe for beginner bakers. Help I have my dough in the insta pot on yougurt setting but I just realized that the yougurt only has a setting of 12 min. Do I have to reset my timer 5 times? Yes I realised that it was set at 12 hours lol. Not an idiot at all 🙂 don’t say that! If you’ve never used that function before then it was a very logical assumption!